There’s no question that physician referrals are mission-critical to your hospital or health system’s bottom line. But increasing or maintaining referrals requires more than just an occasional visit to the practice. A successful physician sales program must promote quality and solidify your hospital as the hospital of choice for their patients. Kriss Barlow gives you the keys to successful physician sales! Take your physician relations program to the next level with A Marketer’s Guide to Physician Relations: Best Practices for Successful Sales Programs. HealthLeaders Media has teamed up with healthcare marketing superstar Kriss Barlow to bring you this new, must-read guide for developing, positioning, and enhancing your physician sales program. Backed by years of in-the-field experience, Barlow offers numerous tips and examples from your healthcare peers who have implemented successful physician sales programs, and are reaping the rewards. Put these proven techniques and strategies in place at your hospital to increase referrals, revenue, and your overall market share. 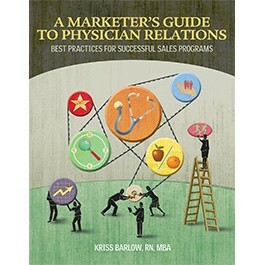 Order your copy of A Marketer’s Guide to Physician Relations today! Kriss Barlow RN, MBA, Principal, Barlow/McCarthy, a consulting group focused on hospital-physician solutions. For the last 11 years, Ms. Barlow, a certified sales instructor, has used her extensive knowledge of clinical and business development to support clients in physician relations, retention and sales, physician recruitment, and medical staff development. A nationally-recognized healthcare speaker, Ms. Barlow has presented at conferences for the Forum for Healthcare Strategists and the Society for Healthcare Strategy and Market Development (SHSMD).